With Secret Cinema’s previous – properly secret – screenings, part of the pleasure was in the game itself, the state of not knowing. The name of the film was kept under wraps and they drip-fed you clues in advance. The fun was partly in the unpicking of the mystery, the playing of intricate in-world games as you pieced things together. But that’s only ever been one strand of the work made by Fabien Riggall’s Future Cinema company. It also hosts large-scale film events, including takes on Top Gun, Ghostbusters and last year’s presentation of Back to the Future, which saw them recreate 1950s Hill Valley in east London. This style of show is more about the creation of a themed environment, an opportunity to dress up and lose yourself in the world of your favourite film. Its presentation of The Empire Strikes Back is more in keeping with these, albeit on a much larger scale. When tickets went on sale in March there was much rumbling about unpaid actors (though this turned out to stem from a casting call out dating back to 2010 rather than the current production). When I asked about it, a spokesperson for Secret Cinema reiterated that “all performers and creatives are paid equal to or greater than industry standards,” while Riggall has also stressed in the past that Secret Cinema is “a massive employer of performers”. On paper, that’s all very worthy, but it’s notable that the company also runs a volunteer scheme, participants of which are paid only expenses. Peter Bradshaw, writing in The Guardian, called Secret Cinema’s Back to the Future “an impressive festival of fan love” and that description applies to The Empire Strikes Back, too. It is fan service on a huge scale. There are moments of grin-inducing brilliance – at its best it reminds you exactly why you loved the films in the first place and satisfies that primal childish wish to step inside these worlds, to charge down a corridor on the Death Star, to hear that familiar hum and swish of a lightsaber coming to life. There’s a clear thirst for this kind of escape and Secret Cinema taps into that. It also taps into the need people have to experience things in a live environment and as part of a group. This is very much a communal experience, which the emphasis on dressing up (Han Solo, Luke Skywalker, Princess Leia etc) only strengthens. There were a lot of looks of admiration (or something akin to it) for the dude who went full Jabba. One of the first things that happens when you enter the space is that your phone is sealed into a silver pouch (fortunately not made of carbonite) to discourage engaging with this fantasy world via a screen. The focus is on liveness and play, and the audience responds to that accordingly. And yet it’s hard to talk about any of this without discussing price. As has been much debated elsewhere, standard tickets are £75 and for children (8-17 years old) the cost is £50. Anecdotally I’ve spoken to both Star Wars fans and Secret Cinema regulars who’ve baulked at this price tag, and who’ve felt that, for them, it’s been a line they’re not willing to cross. Plenty of people clearly are happy to cross it though and notions of value are, of course, relative. A meal for two at a smartish restaurant will easily match that. Want to see Book of Mormon on July 4 and sit in the stalls? That’ll cost you £77.25 (up to £202.25 for a premium seat, or as little as £22.25 on weekday matinees. Top price stalls seats for Gypsy on the same night are £84.50 with a premium price of £99.50 (of course there are cheaper, lesser seats). 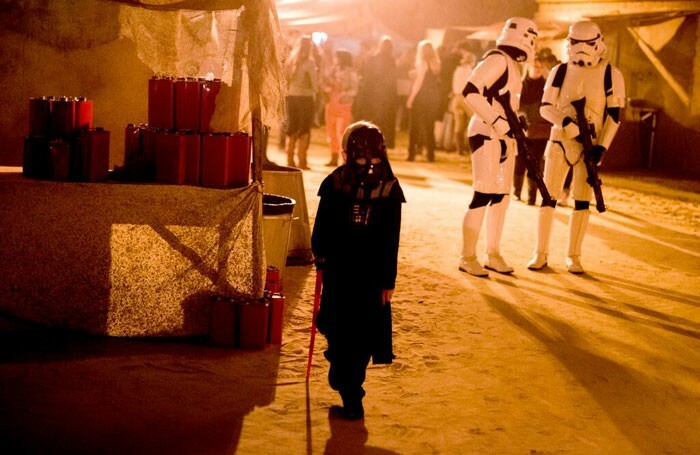 Mercifully, at Secret Cinema’s The Empire Strikes Back, there’s just the one flat price. But it’s likely you’ll spend more in the bar. There’s a fair bit of milling about – and as the doors open at 5.30pm and the party continues past 11pm, you’ll probably be tempted by one of the food vendors too – lamb wraps, mac ‘n’ cheese, brownies – along with a couple of pleasantly potent cocktails care of Bourne and Hollingsworth. Unless you have a gold bikini or a Jedi robe in your wardrobe you might also end up splashing out on a costume (and Secret Cinema has a secret store if that’s the road you choose to go down). So it’s quite likely you’ll actually spend closer to £100. But with so many other themed cinema events springing up it – mainly inspired by Secret Cinema, to be fair – it does make sense for the event to go bigger, to play the scale game. And this is a truly huge undertaking: the space is vast, bigger even than Back to the Future, and contains multiple sets. Running costs must be high. The cost of creating, and maintaining, these venues is huge. But as Secret Cinema “will not reveal information regarding ticket sales or production costs” it’s a hard thing to gauge. While my review for The Stage might have sounded a touch curmudgeonly, it’s not that I didn’t have fun. There were some lovely fangasm moments and the screening itself was thrillingly realised, while the space is amazing in its own right. But the sense of upselling taints the experience as a whole. I’m (always) more than happy to splash out on a drink or two, but would have been infinitely happier to spend that cash on a pint of something decent, rather than the tepid beer mentioned in the review, had the option been available. The care and attention to detail frustratingly fell away in places (if you fancied a smoke, for example) and there was this pressing sense that spending was central to getting the most out of the experience. It turns out that even in a galaxy far, far away you are never more than five minutes from a guy trying to flog you some falafel. How much does it cost to insure a knife thrower's assistant?